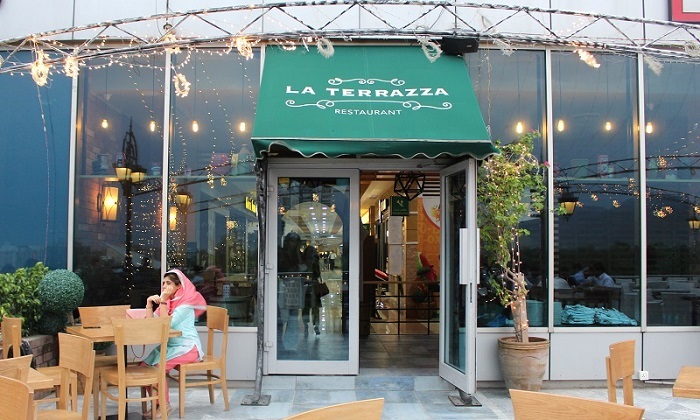 Lit by lovely hanging lamps, offering comfy outdoor seating and a remarkable view of the Islamabad city, La Terrazza is the place of celebration of Ramadan festival. 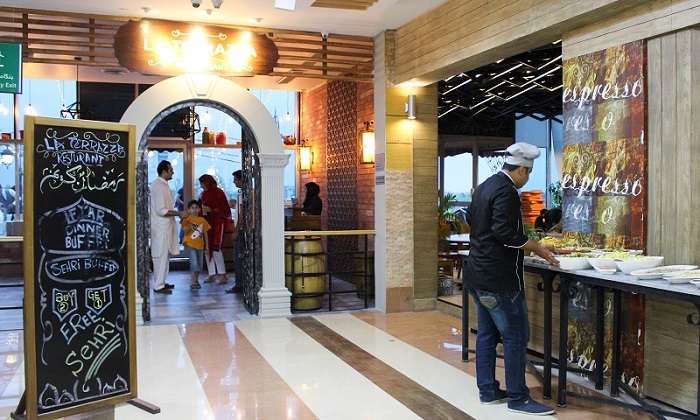 The unique combination of Pakistani Iftar food items and authentic Italian cuisine offers a unique and memorable Iftar experience. at La Terrazza. 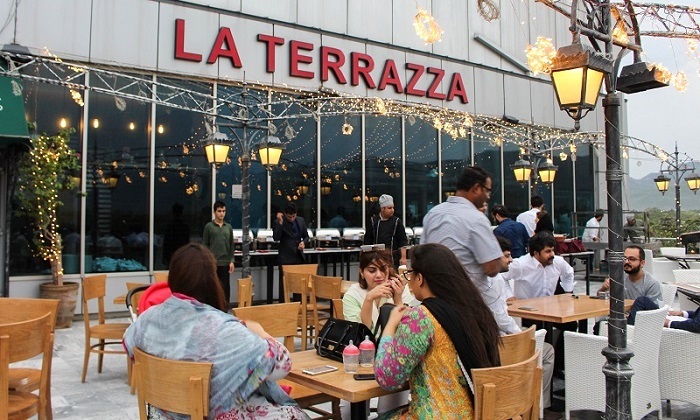 Every table at La Terrazza is exclusive as it offers the striking view of the Margalla Hills and the city, making it a picturesque location to begin and break your fast with family and friends. Fruit chaat, Spring rolls, Dahi phulki, Pasta, assorted vegetable salad and of course Pakoras. Loved the salad, pasta. hummus and spring rolls. German Potato Salad, Apple Cabbage, Pesto Pasta with Sundried Tomatoes, Roasted Beetroot with Feta, Hummus with Grilled Pita, Moutabel, Fattoush, Baba Ganoush, Peri Peri Olives and Pita bread. Pesto Pasta and hummus was delectable. Fruit salad and Dahi Phulki. Fried Fish with Tartar Sauce, Moroccan Chicken, Beef Oyster Sauce, Alfredo Pasta with Grilled Chicken, Seasonal Sauteed Vegetables, Vegetable Fried Rice, Chicken Makhani, Chicken Malai Boti and Roghni Naan. 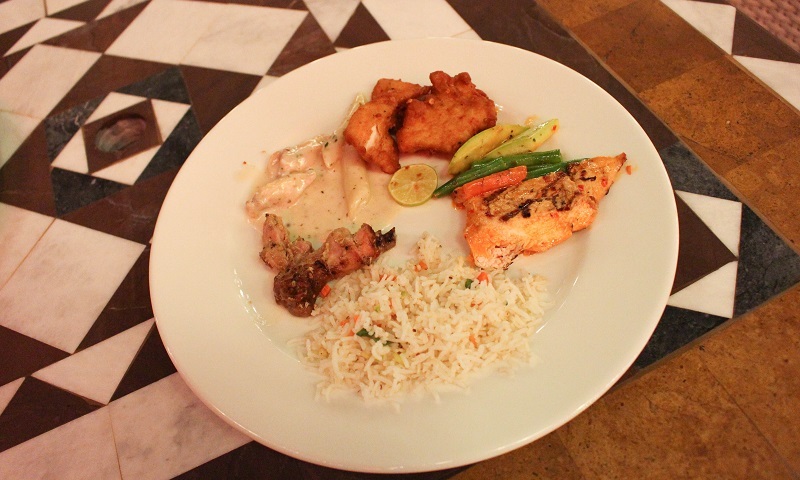 Our favorite at La Terrazza: Moroccan Chicken, Alfredo Pasta with Grilled Chicken and Fried Fish. Bread Pudding, Assorted Pastries, Basbousa, Lahori Kheer, Fruit Trifle and Souffle. 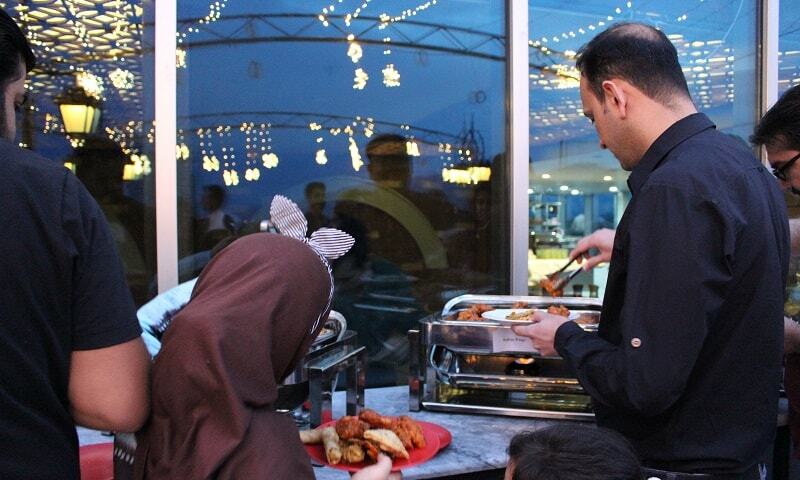 The variety of appetizers and Iftar items was nutritious, made with fresh ingredients and tastefully appealing. The main course was flavorful and had some winners like Moroccan Chicken, Alfredo Pasta with Grilled Chicken and Fried Fish but others like Chicken Makhani, Chicken Malai Boti failed to blow our minds. The desserts – pastries, bread pudding and Kheer – made a lasting impact. 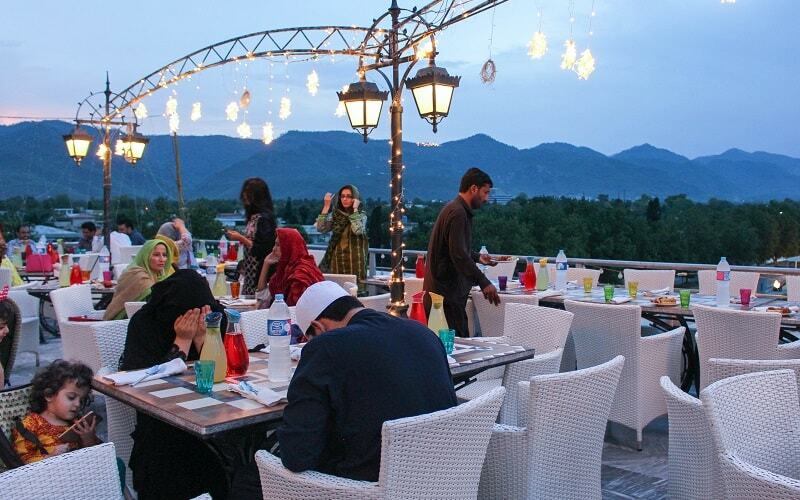 The outdoor seating with a marvelous view of Margalla Hills adds serenity to the dining experience. The cool breezes can make you day just perfect. The lovely hanging lamps and yellow lights give the place heavenly look and feel. We found the service people friendly and observant. However, we would have appreciated a little more care and attention such as bringing napkins without having to ask. We admire the tasteful presentation of the appetizers and desserts. Since the main course was buffet, there was not enough room for pretty decorations there. With such variety of delectable cuisine, lovely ambiance and outdoor dining experience, the restaurant is somewhat reasonable at Rs. 1599 + Tax per person. 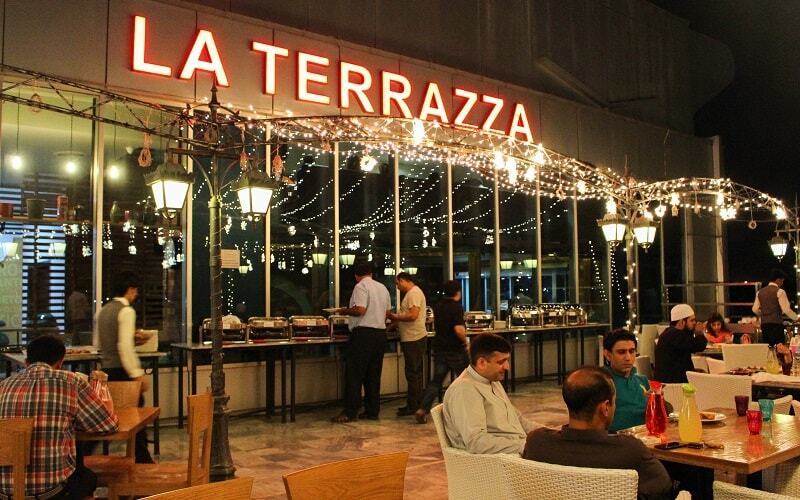 Here are some photos from our recent visit La Terrazza to give you an inside view and review. Hope you enjoyed the virtual visit. You will definitely enjoy the delicious food, amazing outdoor eating experience and the view from the place. 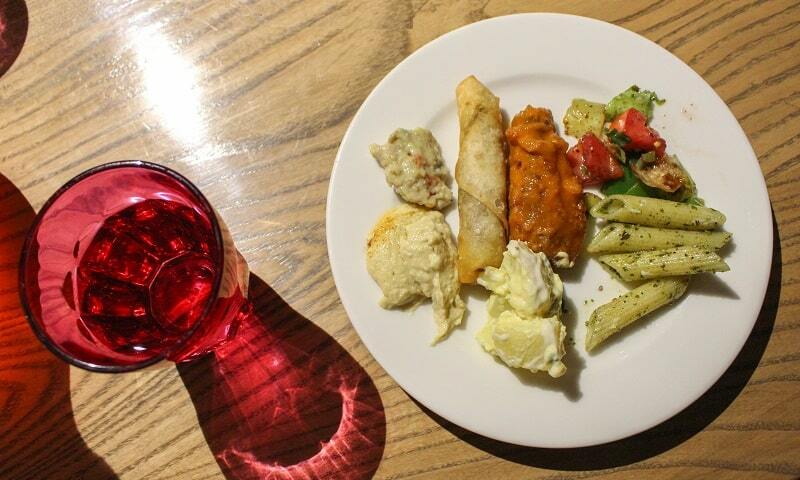 La Terrazza’s Iftar buffet is available at Rs. 1599 + tax and Sehri buffet for Rs. 799 + tax. This year, the restaurant is offering Buy 2 get one free on Sehri Buffet deal. Address: 317, Third Floor Terrace, The Centaurus, Islamabad. P.S. All photos are copyrighted material and all rights are reserved.